Play Age of Privateers online for free now! Age of Privateers is played on 5 reels with up to 50 win lines. This slot is about pirates and their hunt for the largest treasures hidden in the sea. You can score the highest winnings with the steering wheel symbol which is also the Scatter symbol. 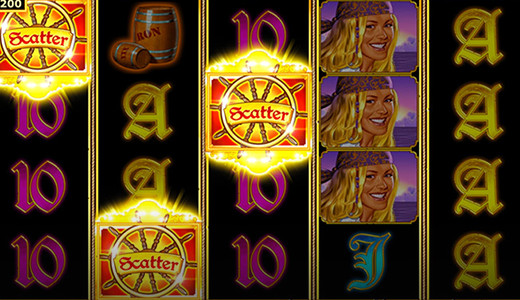 Your aim with Age of Privateers is to land 5 identical winning symbols on one of the 50 pay lines. These start on the first reel and run along the playing field to the last reel. With the help of the steering wheel, the Scatter symbol, you head straight for Twist heaven: When it lands 3, 4 or 5 times in any position on the reels, free games are triggered. And what's a pirate ship without its captain? As a Joker symbol he can substitute for all other symbols except for Scatter and increase your winning chances tremendously! When you have won enough Scatters 12 free games are triggered that are played with line numbers and stakes of the regular game. During the free games every single win is multiplied by 4! If at least 3 more Scatters appear on the reels you win further free spins. Once more, the pirate captain is the ace up your sleeve: If he appears 20 times following a spin the progressive jackpot is yours! You receive the entire jackpot if you have bet the maximum stake. With a lower stake you receive the relevant share of the jackpot. Get away from it all, drift like feathers in the wind and take things as they come - a pirate's life sure sounds swell. Let the rough sea be your guide in Age of Privateers and be amazed by the bounties it holds for you. Nothing can go wrong under the leadership of the pirate captain with a firm grip on the steering wheel - you will be sailing into lucrative free games in no time!